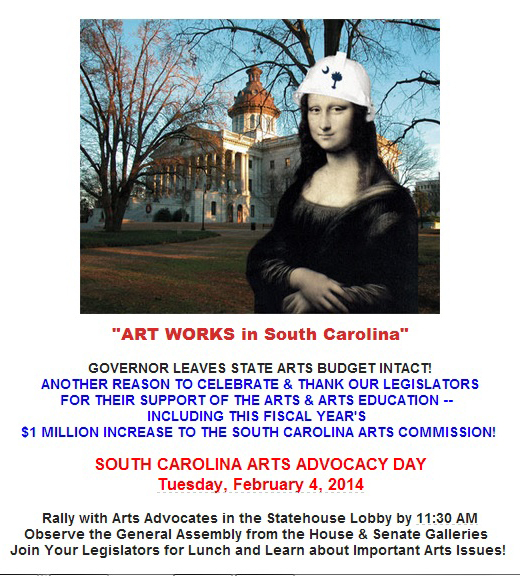 I saw I had an email the other day from the South Carolina Arts Alliance, and I figured, “Well, it’s about that time, when they’re gearing up to fight Nikki Haley’s budget.” I assumed this was the first of a series of increasingly frantic notices, as in 2012 and 2013. I knew she was seeking to add funding for poor rural school districts, and boost spending on mental health, but now the arts? I suppose the Democrats will call that election-year opportunism as well, but that raises the question: Is she right? Assume she’s being a complete opportunist here: Is the woman who road to power on the love of the Tea Party right when she now concludes that this is the way to get re-elected. If so, when and how did this change in the SC electorate occur? There’s another way for cynics and partisans to read it, of course — that Nikki believes she has the Tea Party sewn up, and she can afford to go fishing in the political center. But from what I’ve seen, if you don’t agree with those folks on everything, they don’t believe in you. Is there any fury like a Tea Party scorned? The most interesting thing in all this is not what it does to Nikki Haley’s political future, but whether there has been an actual sea change in the electorate. And if there has been, what does it all mean, Mr. Natural? This entry was posted in Arts, Kulturkampf, Nikki Haley, Priorities, South Carolina, Spending on January 20, 2014 by Brad Warthen. I’d like to think she’s wised up, and that many of those who found Tea appealing have. Yay! More of other people’s money to throw at well connected people to spend on their taste in “art”. The cheapest votes are the ones you don’t have to pay for yourself. Although it is interesting to see how she has basically dissected and trivialized the Sheheen campaign’s strategy. Now he’s got to run on a “me too” agenda. Sure, art has value. That is the issue. We’re talking about who pays for it and who selects it. What research is there that shows that controlling all other variables, government funded arts programs have a specific positive result? The art you want is not the art I want nor the art that most taxpayers want. People who think they know what’s best for everyone else scare me. I suspect that in your desired world, the arts, recreation, education, and public health issues would be paid for (and thus controlled) by the “private sector.” Welcome to feudalism – and the third world. I doubt Haley will pick many fights with upper middle class folks this year. She’ll just continue to attempt to set them against the working poor and bide her time until after the election to reignite her push to shift more of the tax burden onto the lower-earning sectors. In my world, people would enjoy the arts they like and not pay for the arts other people like. “Good” art would not be defined by the one percenters in the literati. The “Dogs Playing Poker” painting took more skill than any paint splatters regurgitated by Jackson Pollock. And let me clarify my opinion – I have no problem with teaching art, music, dance, etc. in public schools and using tax dollars to pay teachers to do that. I am opposed to using tax dollars to pay for music performances, art exhibits, or sponsoring any adult to create their art outside of an instructional environment. Those endeavors typically rely on the quality of the political connections of those involved over the quality and general interest in the art delivered. Here’s some art for ya:HAPPY MLK DAY! “The great advances of western civilization, be it in architecture or painting, in science or literature, in industry or agriculture, have never come from government. Columbus did not set out to seek a new route to China in response to a majority directive of a parliament, though he was partly financed by an absolute monarch. Newton and Leibnitz; Einstein and Bohr; Shakespeare, Milton, and Pasternak; Whitney, McCormick, Edison, and Ford; Jane Addams, Florence Nightingale, and Albert Schweitzer; no one of these opened new frontiers in human knowledge and understanding, in literature, in technical possibilities, or in the relief of human misery in response to governmental directives. Their achievements were the product of individual genius, of strongly held minority views, of a social climate permitting variety and diversity. Oh, and most of the Renaissance artists, Leonardo da Vinci and Michelangelo among them, were patronage artists to the state – such as it was in a Principality/Vatican driven world. Newton was a professor at Cambridge, Leibniz was a diplomatic correspondent for a Count. Bohr worked and did research in several public universities, and so on. So many of them actually were funded by the government. Yes, they were brilliant — the government didn’t do the thinking, it just provided them with time and opportunity. (Just noticed that no one had brought up that even this list is heavily government-funded). Then there is the Acropolis, the Roman Empire, the atomic bomb, the exploration of space, the TVA/BPA, and the interstate/internet. Just to name a few others. Athens Acropolis – built by Pericles, a Greek military leader. So we can add the military to the list of great advancers of Western (and therefore world) civ. Don’t forget GPS. First a military thing, now fully integrated into daily civilian life, replacing such quaint things as non-interactive maps. Is GPS the marvel it is today, portable, small, and handy because a government edit required it, or is it because many different private companies competed to make it useful to consumers? The end product, the little Garmin is now so ubiquitous, is the product of private enterprise, competition, and a free market. The space program was also military in terms of personnel. NASA looked at all sorts of people out there likely to have the good health and adaptability that they were looking for in their “test subjects” to fly on their rockets. But Ike wanted MILITARY test pilots — men in uniform, who would follow orders. The claims that the government invented the internet are liking claiming the guy who invented the axle invented the auto industry. Since the Internet is THE great innovation of our age, it is deeply important to libertarians to discredit the fact that it was created by the government. It’s nonsense to say the internet as we know it today was “created by government”. The internet is a classic free market, where many (millions) of individuals and groups compete to offer thoughts, products, services, etc. The military might have come up with a germ of the idea, but the internet as we now know it was entirely unknowable then. Amazon, wikipedia, IMDB, my blog, this blog, etc. It’s all a big, wide-open, swirling market of ideas, goods, services, and information. To say the government (or any one entity) “created” the internet is utter nonsense. Per contra, Bryan. It’s what you’re saying that doesn’t make sense. It’s like you’re denying that the government built the Interstate Highway System, just because most of the traffic on it is private — including a vibrant, complex, enterprising distribution system for goods. Amazon is a highly innovative, extremely successful trucking company in this analogy. Sort of a ground version of FedEx (which also would be nowhere without the roads built by government). An axle wasn’t built, the seed of a nervous system was built. The Amazons, Googles and Baidus are pretty insignificant in the long run and that is the beauty of it all. You mean, the last 13 years? Seriously? I can’t think of any great strides forward that have affected our lives in these last few years, beyond social media — blogs, YouTube, Twitter. Beyond that, there have just been quantitative changes — technology getting faster, cheaper. The move from PCs to tablet, mobile. What’s responsible for that? Private enterprise or government edict? I don’t think anyone’s “responsible” for it. None of us could possibly stop it; it’s a living process. I get that what you’re saying is that a competitive environment drives everyone to keep making faster, cheaper technology. It wouldn’t have happened in the Soviet Union. But that’s not invention or inspiration. It’s just a process whereby past inventions evolve. I still say the one real innovation of the past 13 years is social media. And that’s more of a technology-driven societal shift than anything else. No entrepreneur went out and invented social media the way, say, Ford developed the assembly line. Although plenty have stepped forward to take advantage of it, and come up with great twists on it — the best of all, in my opinion, being Twitter. The inventions don’t just magically evolve on their own. Yeah, why bother having patents when we’re all just in this together and every new invention is just a tweak to the output of the grand collective? The truth is that almost nothing comes from nothing. A person who arrives at a great idea is usually in a position to do so because he has absorbed the lessons learned from what others have done. It’s like in my favorite alternative history novel, Guns of the South. Robert E. Lee (who was an engineer) becomes suspicious about the AK-47s that have come back to the Confederacy via time machine because they seemed to have leaped perfectly out of nowhere, and he knows that is impossible. They were such perfect, finished weapons — there had to be less perfect forebears that this was an improvement upon. And he was right. The Kalashnikovs had skipped 150 years of technological development, from his perspective. Yeah, I know it’s science fiction. It’s just that the fact that it WAS science fiction sets up a perfect illustration of the fact that a highly refined, yet beautifully simple invention like the AK cannot and does not come out of nowhere. The Confederacy couldn’t have AK-47s because their technology wasn’t ready. That’s why it could only happen in make-believe. The Web is unlike AK-47s. Since it is virtual and not physical, ideas CAN seem to come out of nowhere. But the person who comes up with a brilliant new way to use the Web is able to execute it because of his experience doing the things (invented by other people) that it builds upon, if nothing more substantial than the basic coding language. I might have a good idea that it would be nice to have a web product that could do X. but I don’t have enough knowledge of what was done before and more importantly HOW it was done in order to know whether it is possible, or how to test whether it is possible. I have to have some knowledge and experience — based on things that went before my inspiration — to know that my idea is even doable. That’s the problem with ideology. One sort of ideologue wants to believe it’s all individual initiative; another sort wants to be everything is done collectively. But there’s a constant interaction between individual inspiration and hard work, and all sorts of other people who were necessary, both before and after the inspiration, to make its practical application possible. SPOILER ALERT: Later in the novel, after the men from the future go to war with the Confederacy and are overcome by sheer numbers and their secret offices in Richmond are discovered, Lee demands that the captured survivors show them how to work the devices (such as an Apple computer) that were found there, and show them how to make such devices themselves. Yes, but isn’t it true that if each one of us has access to all the same base materials, we should see constant, amazing innovation by anyone? Innovation comes from special individuals doing special things that NOBODY else can do. Is the output you produce any better than that of the person who scribbles graffiti on the side of a building? You’re just using words that any other schlub could put together. I would hope you have a higher level of self-esteem than thinking what you can do is just an end product of nothing more than other people’s work. I don’t. Also, developing a system to identify and track Near Earth Objects is up there on the list of globally relevant governmental initiates. She must be on the right track, then! Sweet Jesus, how can supposedly smart people not understand some very basic facts about how stuff works? The Internet is not a “free market.” It’s a highly regulated system, entry to which is tightly controlled by a semi-monopolistic providers whose business is both subsidized by and regulated by the government. Because that’s how stuff works in America. The government underwrites research, whether in the form of outright grants given to research institutions or in the form of tax credits (like the R&D Tax Credit) or tax deductions taken by corporations doing R&D. Then, when the public investment in said subsidized R&D finally results in a new marketable product, the corporate shareholders make tons of money selling their products to the tax payers who made the original investment. That’s how we got the internet. And GPS. And styrofoam. And Viagra. And the fast food industry. Hell, it’s how we got practically everything we buy. Because that’s how stuff works. For a “free market” you may want to consider Somalia: small government, no regulation, lots of guns. Libertarian Utopia. Somalia appears to be the default rebuttal to any statement that questions the government involvement in anything. There are only two forms of government – the perfect democracy of the United States or Somalia. Most progress has a public component. Not to say private entrepreneurs don’t make important contributions, they do. But to suggest everything important we enjoy today is the consequence of free enterprise is ridiculous. Capitalism works well when it’s properly grounded in good regulation included enforced competition. Without the government to act as a catalyst for the grounding we’d end up with runaway pollution, children working in coal mines and an uninformed public unaware of the risks of smoking and other diabolical corporate evils. So let’s keep capitalism but be aware of the extreme dangers of the libertarian model for it. How many people have died because access to potentially life saving drugs has been delayed by FDA regulations? And how many have died because of hastily approved drugs? You mean those approved by the FDA? The ones the regulators allowed? The best defense against bad behavior is a strong and ethical court system. bud, that’s a lucid, intelligent, well thought-out comment. bud – I think it’s important to keep in mind that a true capitalist considers the long run consequences of business decisions. The perverted model we utilize encourages short term thinking. Well managed companies tend to realize that it is in their best interest to operate in a clean, healthy and moral manner. Where does one find these “true capitalists?” As you say, I see a lot of short-term thinking out there. Buffet’s a good example, but maybe not the best example. A really good example would be a well-run family business that is being operated with no plans to sell. Just wait for the second or third generation to gain control…. They don’t self-identify like “true conservatives”. To be fair, those on the left can be just as ideologically nonsensical. We wouldn’t like true capitalists, either. Ours is a world of complex, competitive and multi-faceted interactions, priorities and perspectives. Everything is about effectively negotiating our way through life; without turning into either a cynic or an appeaser. Maybe it’s not capitalism’s fault that people can be tempted by short-term gain at the expense of long term gain. Our society is pretty heavy into instant gratification. But capitalism is a profit and loss system. The losses are just as important as the profits. In fact, you could argue that losses are *more* important, as they kill off bad companies that cannot bring goods to the market that people will buy. The biggest problems arise when we start monkeying around with the market and try to artificially create winners and losers. If you are all about jobs, plenty of studies show that quality employers want to locate where there are plenty of fine / high arts opportunities. Those happen largely only if subsidized, but the payoff has been demonstrated to be real. CEOs prefer communities with orchestras, museums and the ballet. Employers locate for all sorts of reasons, and frequently what they say they want isn’t what they actually want. CEO’s also want low taxes, low crime, nice weather, convenient airports and nice country clubs in addition to the ballet, symphony orchestra and high-falutin’ museums. Non-union states, inexpensive work force, etc. Which comes first, the “high quality” (to be defined) or the “high quality” jobs? 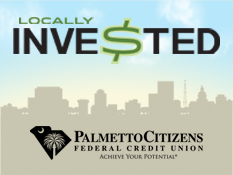 What were the cultural factors that have allowed cities like Greenville, Raleigh, and Charlotte to outpace Columbia? Did they have better arts programs? They have fewer civic bone-heads. Actually a very good question. What was the difference between Charlotte and Columbia in 1950? What about 2000? What did Charlotte do differently over the intervening 50 years? The arts and education are frequently cited.